Lyme disease was named for Lyme County, Connecticut, where the disease was first identified. The disease is caused by a spiral-shaped bacterium known as Borrelia burgdoferi. It is a spirochete that is transmitted by a tick, most commonly the Deer Tick, also known as the black-legged tick, which can be smaller than a sesame seed. Chronic (aka persistent or post-treatment) Lyme disease refers to symptoms that continue after antibiotic treatment. It is an imprecise term that can describe a number of ailments, but all are potentially related to undiagnosed or untreated Lyme infection. Do you have any of the symptoms below? 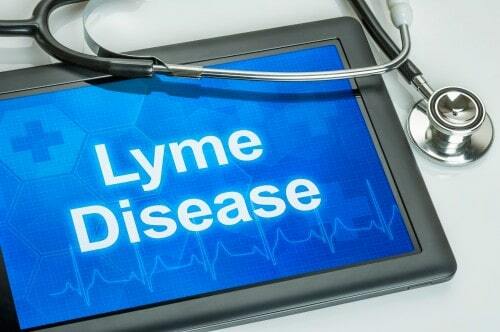 Acute Lyme disease causes symptoms that develop after a tick bite such as the traditional bulls-eye rash known as erythema migrans (EM), flu-like symptoms and other rashes. The acute phase of Lyme disease is very hard to specifically diagnose unless a tick and the EM rash are clearly present. ILADS (International Lyme and Associated Diseases Society) reports that up to 50 percent of patients never had a rash and up to 50 percent of patients didn’t know they had a tick bite at all. Many people still believe Lyme disease occurs primarily in the Northeastern part of the United States, but Lyme disease has been found in many parts of the country although it is still more prevalent in the Eastern US. The test used to detect Lyme disease is also fairly unreliable and may miss up to 35 percent of all cases. Additionally, blood testing does not always identify antibodies against the spirochete making detection more difficult. Chronic Lyme symptoms can occur months or even years after the first infection and may last just as long. Many patients begin to experience symptoms of Chronic Lyme disease much later than the infection date making the symptoms appear to have come out of nowhere. Chronic Lyme disease can affect the skin, brain, nervous system, muscles, bones, cartilage, and every other body system. This is a truly pernicious disease. The Mayo Clinic reports the use of oral antibiotics including doxycycline, amoxicillin, or cephalosporin for 10 to 21 days or IV antibiotics for 14 to 28 days are quite an effective treatment and most patients recover quickly and completely within a few weeks. While antibiotics are often used in the treatment of Lyme with varying degrees of success, it is the alternative treatments that have been the most helpful for many patients and have been viewed as “what saved me.” As with many alternative treatments however, there is little clinical research to support their claimed effectiveness. Acupuncture – Though it won’t treat the infection, it has been useful for managing pain and other symptoms. It may also help to activate the immune system or increase the overall health of the patient. Herbs to treat infection – Herbal medications that have shown anti-infective activity such as Cat’s Claw, Stephania, Samento, and Japanese knot-weed are thought to be helpful. Probiotics – As the majority of the immune system is centered in the gut, the consumption of probiotics such as organic yogurt, kefir, and supplements containing lactobacillus bacteria may be of use. This is particularly important as many Lyme patients have digestive issues. Herbs with anti-inflammatory effects – Herbs such as Turmeric, Ginger, Garlic, Cinnamon, and Boswellia may be of some use to decrease inflammation. Again, this will not treat the infection but may help some body systems to heal and may help to reduce painful symptoms. Exercise – Many people diagnosed with Lyme find themselves fatigued. With light exercise however, one can experience improved blood flow and oxygenation to muscles and other body tissues which can help eliminate some inflammation and increase their overall energy levels. At present in the traditional medical community, it remains a disease that is little understood, difficult to diagnose and with limited treatment options. Alternative treatments may be more effective and are certainly easier to obtain. If you suspect that you have Lyme disease, look for a physician who has taken the ILADS education program. This is just the start of what you need to know about Lyme disease. Take a look at our Lyme disease topic page to get a broader understanding of this complicated and perplexing disease.